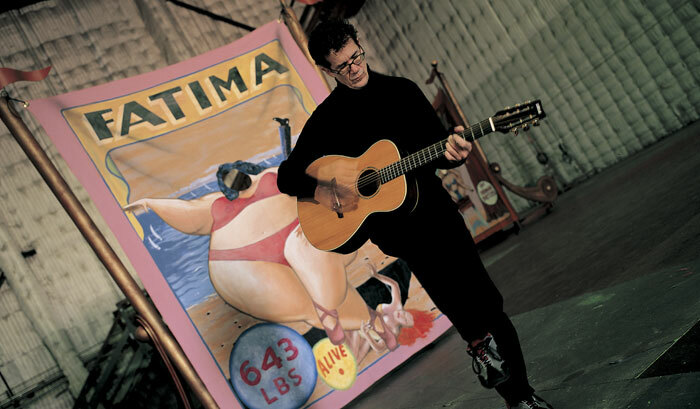 Guitarist Jon Herington has played with artists as diverse as Michael and Randy Brecker, Eliane Elias, the Bacon Brothers, and most recently, Steely Dan and Bette Midler. But it's taken him a while to come to terms with his own versatility. "All the players I've idolized over the years have been specialists," he explains. "it's easy to notice the guy who specializes in a certain sound, but people tend not to recognize players who are more diverse. Still, every time I've tried to focus on just one area of my own playing, I've missed doing all the other things. It's my curse-I just like a lot of different types of music." It's my curse--I just like a lot of different types of music. Herington recently completed a North American tour with Steely Dan. "That tour was a good example of how I was recently rewarded by being more versatile," he notes. "The kinds of songs they play can't be done by people who don't have an understanding of many different types of music." Playing with Steely Dan offered some unique musical challenges, even for such a multifaceted player. "There were definitely issues about how to approach the songs," says Jon. "A lot of the fans know the guitar solos from those records even better than they know the lyrics-they're really ingrained in people's memories. So basically I had to balance between two things. One was my love of the great work that had been recorded originally, which I had to honor in some way. On the other hand, this wasn't a cover band, and there had to be some room for originality, a chance to grow the music from night to night." It helped that Steely Dan leaders Donald Fagen and Walter Becker were sensitive to this balance. "Those guys are such jazz buffs, they don't expect the same thing every night anyway," says Herington. "Still, can you imagine doing a song like 'Reelin' in the Years' without that guitar lick at the beginning? Actually, they did perform it without that lick for years on tour, but I think a lot of people were disappointed, because they were like, 'wait a minute, you've taken away one of the big reasons we love that tune!' I had to consider that kind of thing, because I'm a fan, too, and yet I didn't want to lock myself into doing the exact same thing all the time. Sometimes I would take the sound of a solo as the starting point, rather than the exact riff, because the tone seemed even more important than the actual notes." Walter Becker shared guitar duties with Herington. "He was pretty funny, when we first got together to work stuff out," Jon recalls. "He said, 'okay, you get to play all the hard stuff, and I'm just going to play blues licks whenever I feel like it!' He was joking, of course, because he's a great soloist in his own right. We're such different types of players that it worked really well. He has an evenness and confidence about the way he plays. Basically, he would play the solos he'd done on the records, and I was playing the more cranked-up stuff, the kind of parts Jeff Baxter, Larry Carlton, and Steve Khan would do." After the Steely Dan tour wrapped up, Herington became part of Bette Midler's new production. "It's a very different scene from Steely Dan," he says. "Bette's most recent album was a Rosemary Clooney tribute, so I'm playing a lot of standards. Some of the old charts we're using are great!" Jon was recently introduced to Yamaha guitars by his new friend, guitarist Frank Gambale. "He's a huge Steely Dan fan, and we got to hang out in LA," says Herington. "And he was telling me about recording on this new Chick Corea record, playing a lot of stuff with a Yamaha FPX300 acoustic guitar. It has a smaller body than a dreadnought, and it's sort of strung light. I noticed it had an internal mic-in, a pickup, and a blend control. I'd also seen James Taylor using one of these guitars, and he always sounds great. So when I started doing the Bette Midler gig, I needed a new nylon-string and steel-string, and I decided to try out the Yamaha." Herington's nylon-strings are a single-cutaway CGX17KCA and a thinline APX9NA. Herington is especially pleased with the sound of his new steel-string through a Yamaha AG Stomp modeling pedal. "The Bette Midler guitar tech found a mic-modeling setting on the AG Stomp that just works amazingly well. It's the best high-volume acoustic sound I've heard. And the nylon sounds great through that thing, too. The intonation on both guitars is really good. They have a great acoustic sound, and they're always in tune." You can read more about the versatile Jon Herington at www.JonHerington.com.